The Fuel Tank Shop are the largest online retailer of oil and fuel tanks in the UK. Fuel Tank Shop Ltd is a trading division of Kingspan Environmental Ltd, part of the Kingspan Group. The Kingspan Group is a global leader in high performance insulation and Environmental storage systems and owns a range of Oil and Diesel Tank manufacturers including Atlas, Deso, Titan and DieselPro. As part of the Kingspan Group all customers can be assured that Fuel Tank Shop Ltd will always work to the highest standards and our customer service record is second to none. Fuel Tank Shop have been awarded Gold Trusted Merchant by Feefo two years in a row. 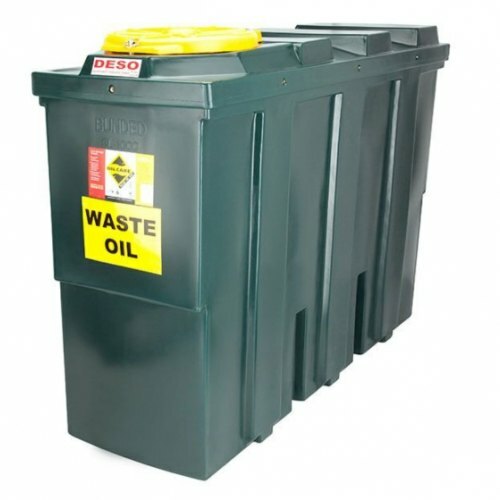 We sell competitively priced OIL TANKS and DIESEL TANKS available to buy securely online, backed up excellent customer care. We offer UK and International delivery. Our tanks have a wide range of uses in domestic and commercial, and rural installations. We are a British supplier of Bunded Heating Oil Tanks, Bunded Fuel Tanks, Mobile Diesel Dispensing Units, Adblue Tanks, Waste Oil Tanks and Single Skin Oil Tanks together with a wide range of Tank Level Monitors, Tanks Security Equipment and Storage Tank Accessories. Fuel Tank Shop can supply transportable fuel bowsers up to 3,000 litres. Our bowsers can be site tow or highway tow bowsers and Skid bowsers. Diesel pump options from simple hand pumps right up to multi-user fuel management systems are available. Whether you want a bunded plastic tank, single skin tank or a high security steel diesel tank, take a look at our range. Fuel Tank Shop can supply security cages for gas bottles and heavy-duty tool safes and high security tool chests. Fuel Tank Shop ONLY sell fully approved and CE marked plastic oil and diesel tanks. Be aware that other online retailers may offer cheaper tanks but they will not have current or official CE markings! It’s advisable to ask to see current Approval Certificates. Some online retailers will try to give you out of date certificates, this means the tanks are not approved, they will be made with inferior recycled plastic, these will not last. We supply tanks to domestic, commercial, industrial and agricultural customers with nationwide delivery. We have a range of tanks in stock in our warehouse in Minehead, Somerset for quick delivery. We can offer next day on tanks that are in stock, subject to time of order. Our tanks range from 20 litre jerry cans through to 200,000 litre steel bunded tanks. We can build bespoke high security tanks with all steel construction suitable for the harshest environments. We have supplied local authorities and transport companies that require the highest level of security and fuel management. We offer portable diesel kaddies and diesel trolleys for onsite refuelling and offer a range of diesel bowsers from the leading Bowser manufacturers in the UK. We work closely with local OFTEC approved installers. OFTEC approved installers are available to install domestic and small/medium commercial tanks throughout the UK. Using the OFTEC guidelines we can advise you on tank choice and positioning and base requirements so that you meet OFTEC regulations.